Louis Sullivan from Glass to Gingerbread. 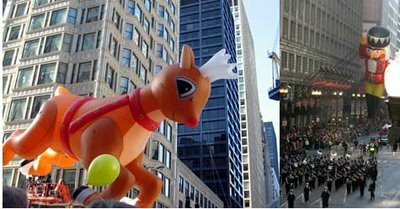 With three of his Chicago buildings destroyed by fire, the 150th birthday year of architect Louis Sullivan has not not been an altogether happy own, but December has a been a bit kinder. 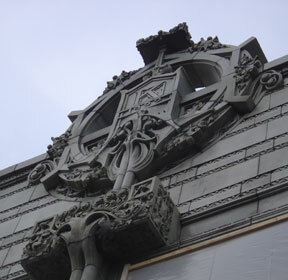 Our correspondant Justin Luety had a Christmas eve post on his Urbs in Horto blog with several photos of the windows just installed in the richly ornamented and recently renovated Louis Sullivan designed facade for the former Krause Music Store on north Lincoln, the architect's last commission. While not actual replicas of the originals, they fill out the facade, an official Chicago landmark, handsomely. Not so lucky was K.A.M./Pilgrim Baptist Church in Bronzeville, another Adler & Sullivan masterwork that burned to the bare walls just one year ago. 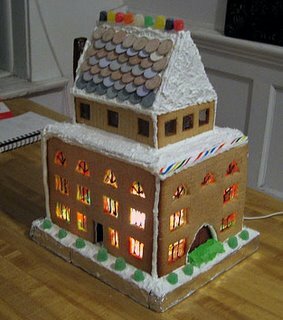 The indefatigable Joan Pomaranc tips us off to a unique, seasonal tribute to the lost building by Sullivan enthusiast Shannon Saar, who devoted 30 hours to creating a gingerbread version of Pilgrim Baptist. Read about it on the Chicagoist blog, and view a photoset of the project being made at Flickr. Via the Reed Construction EWire we came across a story by Tom Ramstack of the Washington Times on the new, 438,000-square-foot, $139,000,000 (up from 295,000 square feet and $104,000,000 just before 9/11) headquarters for the Bureau of Alcohol, Tobacco and Firearms. Now scheduled to open next February, Ramstack reports that it's the first structure to comply with all of the high security features recommended after the 1995 bombing of the Alfred P. Murrah Building in Oklahoma City. The result is the kind of moated bunker that has become the standard response to the threat of terror. Read about it here. What's with this sick compulsion to create year-end top ten lists? Can I resist? Obviously not. Read about the buildings, people and events that made the cut, and see all the pictures here. Universally, Christmas is a celebration of the triumph of light over darkness. Chicago just may have access to more bulbs than average. See all the photo's here. Calatrava Spire regains taper in "Version D"
No renderings appear to be had yet (and if you have them, please forward so I can post them), but Kevin Nance, architecture critic of the Sun-Times, and Blair Kamin, architecture critic at the Tribune have stories today on another round of changes to Santiago Calatrava's proposed 2,000-foot-high Chicago condo tower. 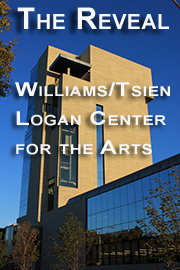 The previous iteration, announced earlier this month, bulked up the building to 3,000,000 square feet, and eliminated its namesake spire. Kamin and Nance report that a new version, that restores a taper to the top of the project, is being run past the mayor, community groups, and the city's architectural in-crowd, apparently to a very positive response. Frank's Home, a new play at Chicago's Goodman Theatre by Richard Nelson starring Peter Weller and Harris Yulin captures Frank Lloyd Wright at the point between despair and resurrection. Read all about it here. The new statistical abstract is out from the census folks, and its statistics on construction and housing confirms George Carlin's observation that we've got so much stuff, we have to get bigger and bigger places to keep it all. Specificially, the median home size is now 2,227 square feet, up from 2,057 in 2000 and 1,905 in 1990. While all other categories have dropped or kept even, the largest category of homes, those over 2,400 square feet, has jumped from 29 percent of total in 1995 to 42 percent in 2005, a whopping 45% increase in just a decade and a half. The use of wood frames has undegone a free fall, from 39% in 1990, to just 7% in 2005. And while vinyl siding has all but disappeared, from 5% in 90 to 1% in 05, the "other" category, which I'm betting includes concrete block, is on a roll, going from 6% in 1995 to 16% in 2005. Bernie Stone, take heart. It's Not Bombed-Out Berlin - It's Our Legacy! 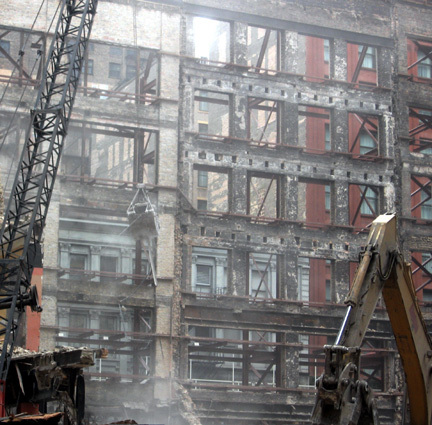 A photoessay on Chicago's latest and most spectacular facadectomy. Read it here. If you haven't already, pick up a copy of this Sunday's Chicago Tribune and go to page 2 of the Perspective section to see one of the most spectacular photos you'll see all year. It shows half of the population of the city surrounding Mayor Richard M. Daley as he announced his bid for re-election at the Gary Comer Youth Center earlier this week. And you have to pick up the paper to see it. On the Trib web site's version of the story, it's nowhere to be found, another demonstration of a general cluelessness about new media that has helped leave the venerable Tribune Company in the position of shopping around its own dismemberment to the highest bidder. The thumbnail here can't begin to do justice to the richness of this photo. It's too big even for the full page width the Sunday Trib gives it; it really calls out for a double-page spread, which the editors were apparently too timid to attempt. Amazingly enough, there is no photographer's credit, although another similar shot of the event on the Trib website is credited to José Moré. The river of humanity, in every possible variation of age, hue, and capability, overflowing that deep red background, invites comparison with Veronese, in another canvas that expands beyond portrait, to a sweeping narrative that invites us to decipher all of its myriad levels of meaning. 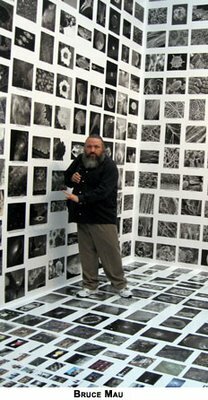 The brilliant graphics designer Bruce Mau says his exhibition Massive Change is "not about the world of design; it's about the design of the world." The world may have other plans. What's the disconnect between the wonders on display and their actual impact on our world? 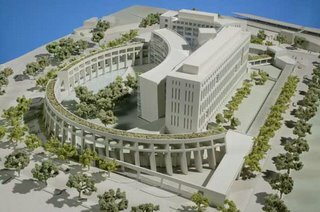 Is Mau's grandiose vision a roadmap to paradise or a triumph of public relations? 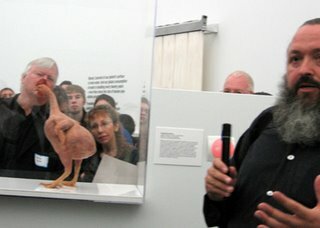 Read all about it - including Mau's commentary as he toured his exhibition - with lots of pictures and links, for both shows - here. 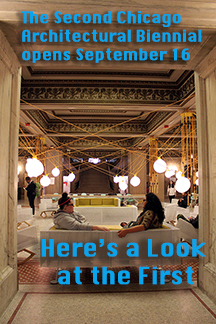 The School of the Art Institute has just put brought on-line a new website, designed by Studio Blue, the firm currently featured in the Art Institute's current Young Chicago show, including a poster for the Ford Calumet Environmental Center Design Competition, in which a bird's nest morphs into its own construction drawing. For the SAIC, Studio Blue creates, in the words of the firm's Cheryl Towler Weese, "a nested structure (imagine the kits, cats, sacks and wives all going to Saint Ives), creating site features that foster an online community, and collaborating with faculty to incorporate webcam imagery of the ever-changing sky on the home page." The site design is very clean and compact. It takes a moment to grasp its basic idiom, but from there you'll find a wealth of interesting content, especially in a gallery that showcases the work of students. (Check out Yongjin Park's witty faux Public Service film for our times, Duct Tape and Cover.) 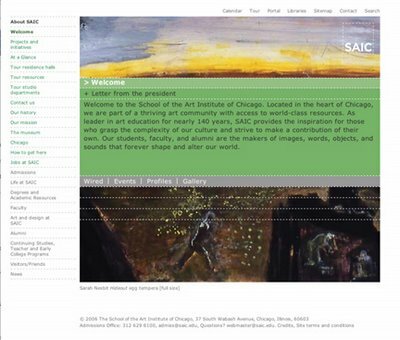 Cruise the new SAIC website here. 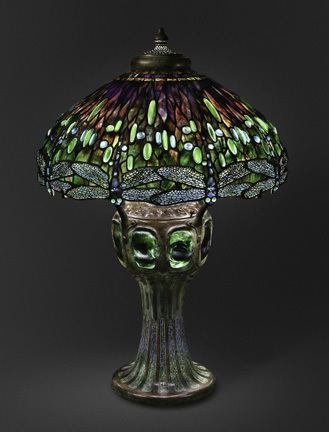 Chai Lee of the Art Institute has sent us this picture of one of the museum's most recent acquistions, created in the New York studios of Louis Comfort Tiffany - a circa 1906 Hanging Head Dragonfly Lamp on Mosaic and Turtleback-Tile Base. The fringe of the stained glass shade is a row of dragonflies with "intricate, web-like wings and luminescent eyes made of bulbous blue-green glass." The lamp is the work of Tiffany designer Clara Driscoll, who "by 1904 had become one of the highest paid women in the United States", earning a $10,000 annual salary at a time when a shop foreman was making $21.00 a week. This photo of Driscoll working in her studio comes from an excellent profile of her remarkable career on the New York Historical Society website. The Dragonfly was not exactly rare - it was a huge popular hit - but the Art Institute says of its own new acquistion that "Although these objects are readily found on the market, an example of this type and quality with a distinguished provenance is extremely rare." The lamp is on display in the Museum's Gallery 171, at the back of the first level of the Rice Building. 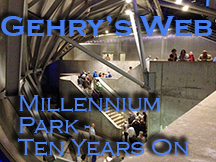 Archeworks is again in the midst of their annual Archcircle fundraising campaign. 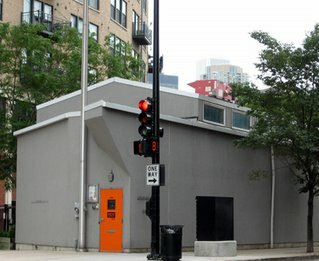 The alternative design school, founded by Eva Maddox and Stanley Tigerman in 1994, offers a curriculum that cuts across disciplines and offers a unique grounding in the ethics, and in serving people and communities which rarely have access to quality design. Operating out of its distinctive, Tigerman-designed Kingsbury Street home with its orange door, Archework's 2006-07 projects include creating design solutions to communicating information in response to the disasters of our time: bioterrorism, natural disasters, pandemics, and perhaps eventually, boils. 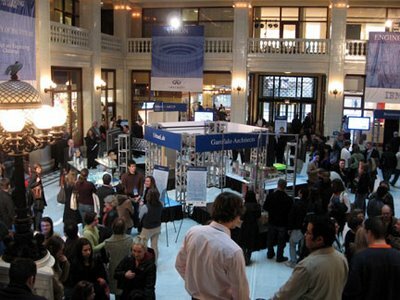 Others projects address the greening of the Museum of Science and Industry, and improving the design of products for stroke survivors. Archework's faculty, historically a who's-who of Chicago's architecture and design community, currently includes former Chicago Sun-Times architecture critic and Deputy Mayor Lee Bey, UrbanLab's Sarah Dunn and Martin Felsen, David Woodhouse, Randall Kober of IIT, Little Village organizer César Nuñez, and strategic planning consultant Giles A. Jacknain. Student tuition currently covers only 14% of Archeworks annual expenses, and the school subsidizes nearly 25% of each student's tuition. Contributions to Archeworks are tax-deductable "to the extent allowed by law", and options for giving include on-line via Just-Give.org. Through December 31st, you can also donate through American Express and get double rewards points, or you can also donate Membership Reward points. 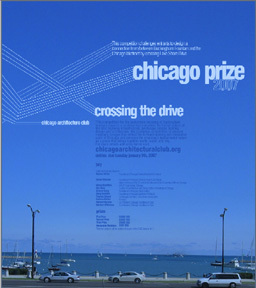 Tuesday, January 9th is the deadline for entries to the Chicago Architectural Club's 2007 Chicago Prize competition, Bridging the Drive, seeking ideas for a pedestrian crossing over (or under) Lake Shore Drive, linking Buckingham Fountain to the lakefront promenade. A surface crossing, controlled by traffic lights, was abruptly closed over the course of a single morning - without notice or hearings - earlier this year. 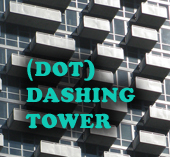 The $5,000 first, $2,500 second and $1,000 third prizes will be awarded January 25th by a star-studded jury that is scheduled to include Marion Weiss, Dan Wheeler, Doug Garofalo, Jeanne Gang, Andrew Metter, ARUP's Nancy Hamilton, landscape architect Thomas Oslund, the Art Institute's Joe Rosa, and CAC co-Presidents Michael Wilkinson and Richard Blender. Q: Will the winning entry be built? If so, will the winning competitor be given the opportunity to contract with the owner as design architect? 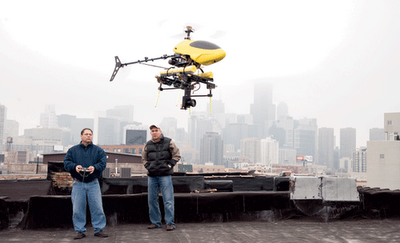 A: The Chicago Prize is an 'ideas' competition, and will therefore not be built. This refreshing honesty - if the explosion of wonderful entries to CAC's 2005 Burnham Prize competition, Water Tanks, is any indication - will not retard the number or creativity of submissions of the 2007 contest, but it does raise a nagging question. 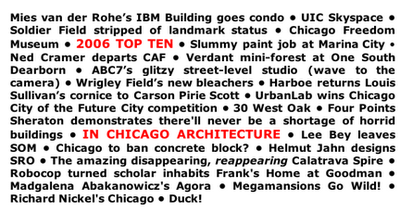 And, yes, I do recognize the importance of competitions to give exposure to newer architects and fresh ideas, but why do I get the feeling that competitions like these are becoming the city's way of throwing a sop to architects and hoping they won't notice the big "Help NOT Wanted" sign for their creativity and expertise when it comes to actually tackling Chicago's wide range of design challenges, for which projects will be built? Doug McCash, art critic of the Times-Picayune of New Orleans (whose Saints, as I write this, are demolishing the Dallas Cowboys), has written a wonderful portrait of new urbanist high priest Andrés Duany, and his often controversial role in the rebuilding the city after the devastation of Hurricane Katrina. He catches Duany at the point where he learns of a "Reinventing the Crescent" plan that would include buildings by Zaha Hadid, Frank Gehry and Daniel Libeskind, contempuously dismissed by Duany as "the genius architects . . . All these people are congenitally over budget." "I am not one of the genius architects," McCash quotes Duany as proclaiming. "I write codes. The basic theme is this: Cities require fundamentals to be in place." Duany cringes at the effect the Crescent City project may have on the vista just in front of newly purchased Marigny home, but quips, "I can't wait to have a brilliant piece of architecture facing my house. It's going to do wonders for my property value." 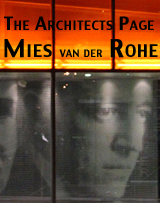 And if he had his choice of "genius architects", it would be Rem Koolhaas. "The others are not fun," McCash quotes Duany as saying "Rem has the irony, fatalism, complexity and bad taste that would work well in New Orleans." "I'm not an ayatollah of traditional architecture," Duany protests to McCash. Read the fully story here. Architect Santiago Calatrava's towering lady is packing on some pounds. 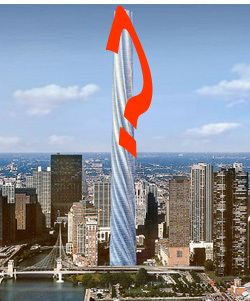 Both Crain's Chicago Business and Chicago Tribune architecture critic Blair Kamin have filed reports on this week's announcement of changes to The Chicago (formerly Fordham and AKA Calatrava) Spire, the megaproject taken over earlier this year by Dublin's Shelbourne Development Corporation. Read about all the changes and the challenges to getting the project built, and see the pictures here. Tomorrow, Thursday December 7th, architect Lynette Stuhlmacher and Debbie Dodge of Docomomo Midwest and Lisa DiChiera from Landmarks Illinois will recommend that Bertrand Goldberg's Marina City complex be designated an official city landmark. One of the most important complex of buildings in Chicago's history, Marina City, best known for the iconic, 578-feet-tall twin "corncob" towers that have become an icon of the city throughout the world. One of the first true mixed-use develoments, it included an office building that is now the 367 room House of Blues Hotel. The House of Blues, itself, occupies the complex's theater. 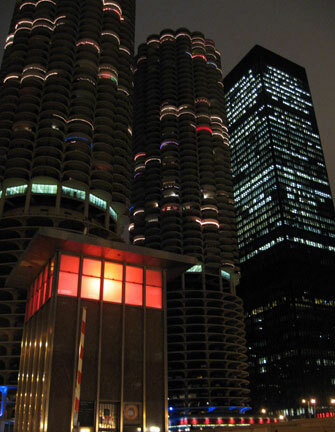 Marina City was the starting point of the back to the city movement that has revitalized Chicago's North Loop. The original skating rink is now a Smith and Wollensky steakhouse, but the complex still includes shops, restaurants, a health club a bowling alley, and a marina on the Chicago River. In October, recreating a stunt from Steve McQueen's last film, The Hunter, a car was driven off the 17th floor and crashed into the river below for an upcoming commercial for Allstate Insurance. This past February, all of Marina City except for the 40 floors of condos was acquired for $114,500,000 by LaSalle Hotel Properties of Bethesda, Maryland. The deal included 896 parking spaces over 17 lower floors, plus 115,000 square feet of retail and restaurants. The new owner has big plans for the complex, but its first step, has been an unfortunate repainting of the lower floors of the HOB Hotel in dark colors of the kind usually associated with back alley loading docks. 1. Critical Part of City's Heritage - first mixed use complex, the keystone to revitalization of the city's North Loop. 2. Significant Historic Event - As if Steve McQueen driving a car off it weren't enough, it has also been home to WCFL, which battled WLS in the 1960's to define rock radio. 3. Significant Person - Marina City was the result of the teamwork of Richard J. Daley, union leader William McFetridge, and Lewis Hill to reinvigorate the city and keep good union jobs in existence. 4. 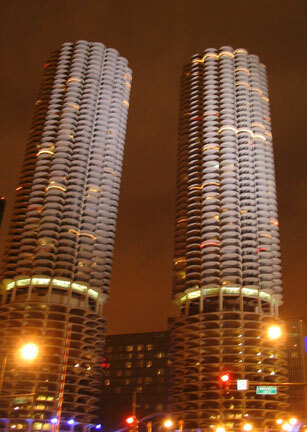 Important Architecture - Marina City is one of the most iconic, instantly recognized buildings in the world. 6. 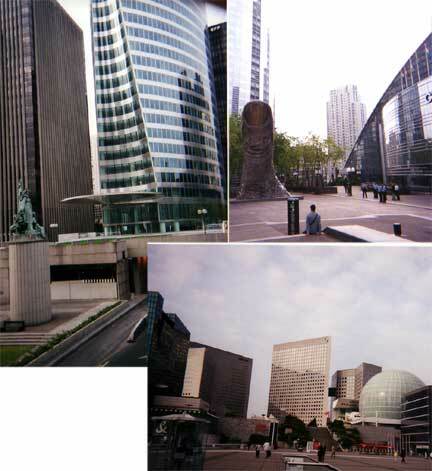 Distinctive Theme as a District - the original focus of the back to the city movement, and unique reinvention of Miesian principles with the freer forms of Le Corbusier, as expressed through Goldberg's own unique genius. 7. Unique Visual Feature - see picture accompanying this posting. If Marina City isn't a landmark, no building is. 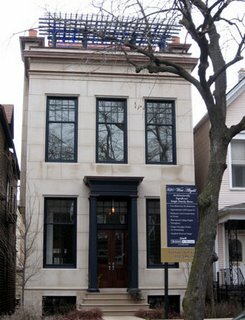 The Commission on Chicago Landmarks has three new members, and how they respond to this effort to begin to protect the city's modernist heritage will tell us a lot about the Commissions future direction and effectiveness. It will also be interesting to see what kind of stand will be taken by Alderman Burton Natarus, whose 42nd ward includes Marina City. In the past, he's been a vocal opponent of forcing landmark designation on reluctant owners, but whatever stand he takes will inevitably become an issue in his campaign for re-election early next year. The 11:00 A.M. session on Thursday, December 7th is designed to received input for possible Chicago landmark designations. 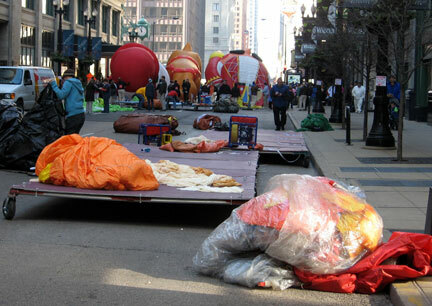 It will take place in Room 1600 at 33 N. LaSalle and is open to the public. Antonio Gaudi - architecture's It's a Wonderful Life? Okay, two years in a row don't a holiday traditional make, but again this December, the Gene Siskel Film Center is bringing back Antonio Gaudi, the 1985 film by Woman of the Dunes director Hiroshi Teshigahara. According to the Film Center, "Teshigahara's eye for texture, shape and sensual detail meets Gaudí's whimsy in the cinematic exploration of such masterpieces of visionary architecture as the cathedral of the Sagrada Familia." 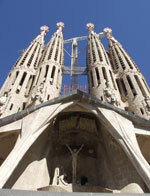 Also depicted are such Gaudi designs as the Casa Batllo, Casa Mila, and Guell Park. 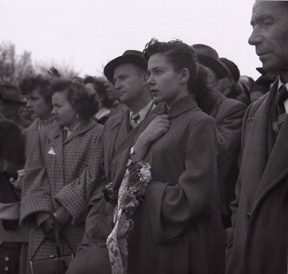 A newly struck 35mm print will be shown, and performances run from Friday, December 15th, through Thursday the 21st. Also added to the December calendar is this Saturday's, December 9th, Chicago Sketchcrawl, which begins at the Auditorium Theater at 9:30 A.M. and requires only a sketchbook, pencils and a compulsion to draw, draw, draw!. 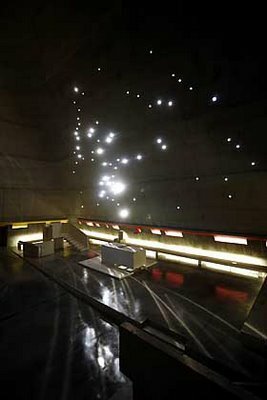 Der Spiegel, which, if the pickups on the Archnewsnow website are any indication, offers some of the best reporting on architecture in Europe, this week published Stefan Simon's recounting of the incredible story of the last project of Le Corbusier, the Eglise St. Pierre a Firminy, just outside the Loire Valley. The church is finally complete and open to the public, although still unconsecrated. 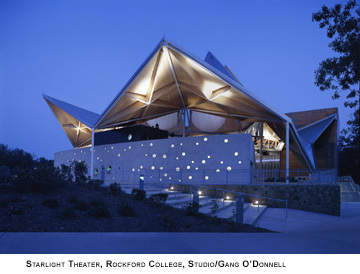 Here's how Simon describes it, "A cone of fair-faced concrete -- a kind of pointed tower with rounded edges. A cube and a cylinder jut, chimney-like, from the slanted roof. 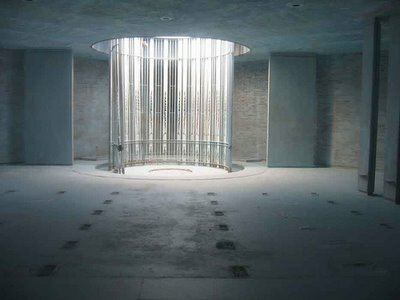 The building resembles the cooling tower of a nuclear reactor or the raised platform on a submarine." Simon quotes Le Corbu biographer Jean-Louis Cohen as describing St. Pierre as the architect's "concrete testament. . . Firminy now constitutes the most important work by Le Corbusier in Europe." Read Simon's story here. Komm Du, Du Letzter . . .
On The New Republic's Open University blog, Chicago's Richard Stern [great interview with Stern here, but watch out for the incongruous forced soundtrack - scroll down to the "off" button on the left hand side] offers up his translation of the last poem of Rainer Maria Rilke, written just two weeks before his death from leukemia in 1926. Sterns writes in response to John Banville's review in the current New York Review Books of a new book of the correspondence between Rilke and Lou Andreas-Salome, the Russian born writer who entranced both Rilke, Friedrich Nietzsche, and , later, Sigmund Freud, who is said to have portrayed her, romantic devil that he was, in his paper On Narcissism. "He had never asked the name of his illness," Banville writes of Rilke, "and his doctor had not told him. . . . 'Help me to my death,' he said to Nanny Wunderly, 'I do not want the doctor's death, I want my freedom.'" Rilke refused morphine; his resolve was to remain concious and aware during his own extinction. It's that experience that Rilke captures in Komm Du, Du Letzter. The translation by J.B. Leishman that accompanies Banville's review is dismissed by Stern as "anti-english", and the line he quotes is, while perhaps correct, also tone-deaf and graceless. Being only barely coherent even in English, I'm not the person to tell you how faithful Stern's translation is to Rilke. The original text is in The Review, so you can judge for yourself. I can say that Leishman's translation scans as if it were created by computer - DOS based, I would imagine - while in Stern's I hear that unmistakable voice of the author of the Duino Elegies, sharing his final moments with us, not with metaphysical evasions, but in quiet intimacy, clear-eyed and heart-piercingly human. Read Stern's full translation here. From our New Orleans correspondent Laureen Lentz, a former Chicago native, comes word of Squandered Heritage, a website she's created with Karen Gadbois to document threats to the city's architectural legacy in the wake of Hurricane Katrina. 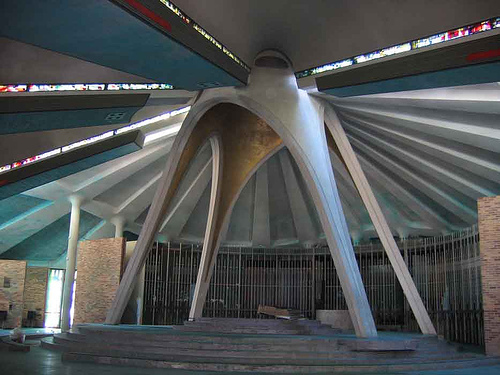 The site includes one prominent building, the striking and beautiful St. Frances Xavier Cabrini Church, a modernist design dedicated in 1963, shown here in photographs by David Gregor. It's become the focus of a last ditch battle to prevent its demolition by the archidiocese for a new school. 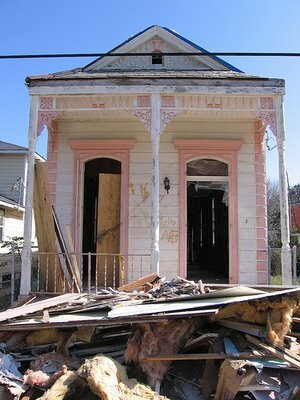 And while most of the other structures pictured on the website are much more modest, perhaps even mundane, they're reminder of how a rich architectural heritage is dependent not just on prominent monuments but on a consistent fabric of buildings of distinctive character, such as the house on Deslonde Street, pictured below, an elegant example of the New Orleans type of shotgun structure that the website reports has been saved and is now undergoing renovation. CSO enters 21st century in big way - ready to download Haitink/CSO Mahler 3rd from iTunes? We'll have more on this later, but the Chicago Symphony Orchestra announced this afternoon that it will be returning to the airwaves next year - the first time since 2001 - with a 39 week series funding by BP. In addition, it will be issuing its own CD's and digital downloads, beginning with this past October's superlative performance of the Mahler 3rd conducted by Bernard Haitink. There's a lot more news in this blockbuster announcement. You can read the press release here. Featherless Chickens Coming Home to Roost? Is Bruce Mau Chicago bound? WBEZ's Edward Lifson has a posting this afternoon on his blog speculating that graphic designer and futurist Bruce Mau, whose exhibition Massive Change is on display at the Museum of Contemporary Art through the end of this year, may be pulling up his Toronto roots and moving to Chicago "and/or open a branch here of his Institute Without Boundaries." A bit of a log-rolling lovefest has apparently broken out between Mau and Mayor Richard M. Daley. Massive Change heaps copious praise on the mayor, and the mayor, in turn, presented specially created awards to Mau and all the other participants in a recent symposium tied in to the exhibition. Lifson thinks Mau may be coming here to help Mayor Daley prepare a Burnham Plan for the 21st Century based on sustainable design, but I'll be happy if he just musters volunteers to bio-engineer an alewife with a voracious appetite for zebra mussels - oh, and maybe a new breed of toilet-trained sea gulls to eat the alewives. 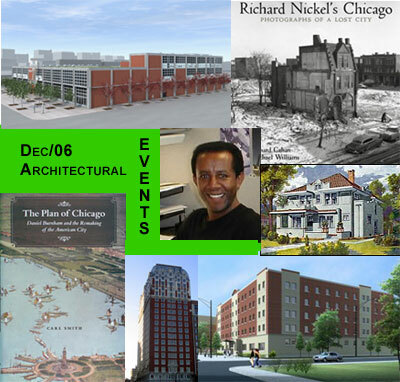 The town shuts down for much of the holidays, but the December calendar of Chicago architectural events still offers up Stanley Tigerman talking about his building for the Pacific Garden Mission, Sam Assefa talks about Sustainable Urban Policy at Archeworks, the authors of Richard Nickel's Chicago and The Plan of Chicago: Daniel Burnham and the Remaking of the American City have lectures and book signings, Franz Schulze talks about SOM at 70 at CAF, and much more, with lots and lots of festive items, including Candlelight tours and sleigh rides at Glessner House and historic Prairie Avenue. Preview the entire December calendar here. 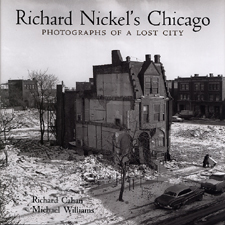 Richard Nickel's Chicago creates an moving portrait of the city and its people at mid-century, of wonders lost, and of the photographer who gave his life trying to save them. Richard Nickel photographed ghosts. 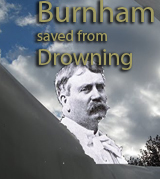 His subjects were the remains of the “City of the Century,” whose wild growth -- from 30,000 people to over a million and a half in under 50 years -- fueled the building boom that created Chicago’s early skyscrapers, its great houses, and the fantasy world of the 1893 World's Columbian Exposition. But by the time Nickel began taking pictures of Chicago in the 1950s, the inner city neighborhoods that had been the city’s pride had been panic-peddled s into slums, and by the late 60's rage piled on neglect and set the streets ablaze, while in the besieged Loop, a rich architectural heritage that was admired worldwide was decimated and discarded as if it were yesterday’s garbage. Read the rest of the poignant story - and see some of the photos - here. Reuters broke the story today that Pritzker-prize-winning Thom Mayne beat out nine other architects, including Norman Foster and Rem Koolhaas, to win the job of designing a new curving skyscraper for the Le Defence, the Paris enclave where modernism goes to die. 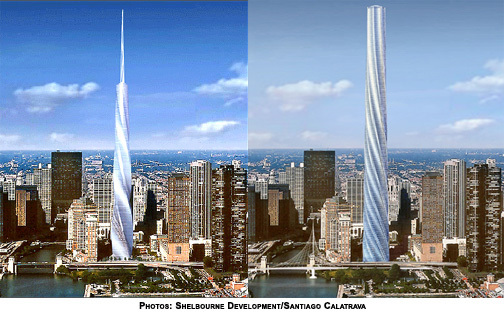 The tower will rise 300 meters, just 24 meters shorter than the Eiffel Tower. 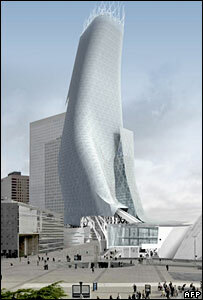 Costing 800 million euros, "Phare" (meaning lighthouse) is scheduled to be completed in 2012. In way of background, here's a montage of some shots I took of Le Defence a few years ago. As you, such development has long been banned from central Paris, which has severe height limitations that have preserved the district's traditional architecture. Publications love to act like the doormen of Club History, indulging the fantasy of Leopold Bloom (Brooks, not Joyce) of going down the line, pointing as they winnow, "You, and you, and - not you." Architects have crashed the party in two current lists. The first is Time Europe's 60 Years of Heroes, where Rem Koolhaas appears, just below the Beatles, in the "Business & Çulture" category. 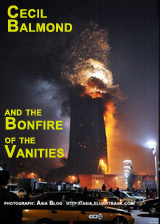 He's cited by the magazine as "the man who simultaneously resigns himself to the chaos around him and sees in it an opportunity for an altogether new kind of order." Meanwhile over at the Atlantic Monthly, the December cover story selects The 100 Most Influential Americans. 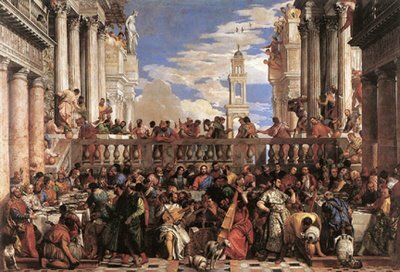 Ten "eminent historians" ranked the lucky centurions, placing Abraham Lincoln at number one, with the usual suspects of Washington, Jefferson, FDR and Alexander Hamilton filling out the top five, but two architects also make the cut. And while Frank Lloyd Wright gets top billing in Frank's Home, the new play, featuring Peter Weller as Wright and Harris Yulin as liebermeister Louis Sullivan, which began previews at Chicago's Goodman Theatre Saturday night for a world premiere December 5th, on the Atlantic Monthly list, Sullivan, at position 59, ("The father of architectural modernism, he shaped the defining American building: the skyscraper.") aces his former draftsman ("America’s most significant architect, he was the archetype of the visionary artist at odds with capitalism. "), who lands at 76, between Babe Ruth and Betty Friedan. Jane Adams is listed at position 64, P.T. Barnum at 67, with Richard Nixon at 99 bringing up the rear, squeaking past Herman Melville at 100. How the three architects fare with the key 18 to 49 demographic won't be known until final national primetimes are released later this week. One moment you're flying high, the center of attention. Young children on their parent's shoulders point to you and laugh in shared delight. The marching bands and anemic floats meander with scarcely concealed envy, knowing the spectators regard them as little more than the filler leading up to your appearance. A thousand cameras focus on each step of your journey, while on TV screens throughout the city, you float down the canal of grand old buildings like a Godzilla who had come to Tokyo, not to destroy it, but to dance through its streets. Then you turn the corner, just out of the sight of the adoring crowds, and suddenly you're getting the air knocked of you. You're being punched, kicked, pummeled. Your nose falls flush against the pavement and your nether end hangs indecorously in the air. You feel your spine being squeezed out of you , your legs stomped flat as pancakes. You collapse. Yet the assault continues, without mercy, until you're nothing more than a bundle of brightly colored rag, stuffed into a bag and put up on a dark shelf, to spend all the seasons of the coming year consumed in angst, worrying whether some freshborn cartoon will steal your place in next November's resurrection. A newspaper averts its gaze - In this week's Chicago Reader, media columnist Michael Miner revisits the story of Malachi Ritsher, the 52-year-old who set up a video camera at the Ohio Street off-ramp to capture his self-immolation in what he intended to be a protest against the war in Iraq. The story was covered extensively both on the web and by traditional outlets all the way to Le Monde in Paris, but was completely ignored by the Chicago Tribune. In covering both the ethics and evasions of the Trib, and Ritsher's own complex, often troubled life, Miner creates a probing, provocative snapshot that reverberates beyonds its intimate frame, towards an epic portrait of the tragic disconnects of our time. A cautionary tale for the CSO? - Chicago Symphony Orchestra President Deborah Card, mired in an ever-lengthening search for a replacement for departed music director Daniel Barenboim, must be getting the heebie-jeebies from the troubles of Christopher Eschenbach, the conductor who headed up the Ravinia Festival for several years before being named music director of the Philadelphia Orchestra in 2003. 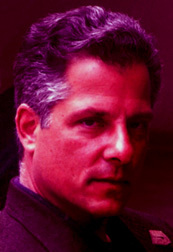 A Wednesday story in the New York Times by music critic Anthony Tommasini details how Eschenbach's relationship with the orchestra began to sour soon after his appointment, with orchestra members leaking complaints to the press that included a claim that the conductor "has gotten lost during performances." He recently announced his resignation, effective in 2008, when his five year reign will become the shortest in the orchestra's history. Fortunately, the CSO players appear to love their two current provisional co-leaders, Pierre Boulez and Bernard Haitink, but it's important to remember that love is not all. Neither Fritz Reiner or Georg Solti were touchy-feely personalities, but they presided over two of the most glorious periods of the orchestra's history. Love is a bonus; respect a necessity. Microsoft against itself - Business Week's current cover story profiles Microsoft's J Allard, the hotshot tech guru and "brash team leader" behind the company's new Zune music player. The magazine plays up the story as the awakening of Microsoft from its self-absorbed slumber, but other reports portray a company still unable to escape its nature, that doesn't enable reformers so much as reprogram them. Reaction to the Zune has often been toxic, from cNet's Molly Wood's description of it as "the wrong answer to the iPod at the wrong time," to Sun-Times tech writer Andy Ihnatko's scathing judgement of the Zune as " a product that's so absurd and so obviously immune to success that it evokes something akin to a sense of pity," and the experience of using it "about as pleasant as having an airbag deploy in your face." When it comes to choosing between the desires of the consumers to which it actually pitches its products, and the demands of music publishers, corporate lawyers, and its own compulsive need for absolute control, the consumer gets short-shrifted almost every time. The true soul of Microsoft remains CEO Steve Ballmer, who, like the alcoholic always promising he'll never touch another drop, is again claiming that the unending delays in getting Vista, the latest in a long line of ever-more bloated operating systems, to market "will never happen again", even as he shoots up with his other major addiction, FUD (Fear, Uncertainty and Doubt), by declaring that companies foolish enough to insist on choosing Linux over Microsoft's own products face "an undisclosed balance sheet liability" from secret Microsoft "gotcha" patents that he claims - completely devoid of disclosed evidence - that Linux infringes. What's Wit the gaping hole on State Street? 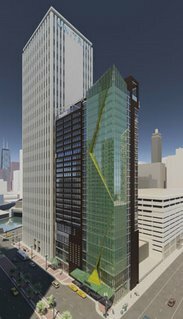 Even as Smithfield's MOMO condo tower continues to reach new heights a block to the south, another site at the northeast corner of State and Lake streets has remained an ugly, empty scar for over a year. 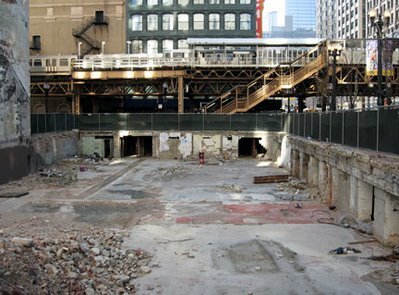 A building that was once home to Chicago's legendary Fritzel's restaurant, but which lived its final years as a fast food ghetto - KFC, Taco Bell, Dunkin Donuts/Baskin Robbins - beneath a succession of empty office floors above, was demolished late last year. An announced condo development never got off the ground, and since then the only activity on the excavated site has been the retention of rubble and rainwater. On Friday, Crain's Chicago Business carried a story indicating that this may be about to change. Developer ECD is putting together funding to construct a 26-story, 298 room hotel on the property at a cost of up to $100,000,000. Part of the Doubletree chain, the hotel is to be called the Wit. I'm not quite sure where that name comes from, but since the death of Algonquin Round Table, God knows our hotels could use a fresh dose of Wit. 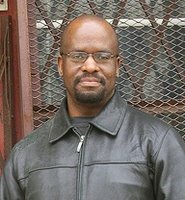 WBEZ's Edward Lifson is reporting on his blog that former Sun-Times architecture critic Lee Bey has resigned from his position as Media and Governmental Affairs Director at Skidmore, Owings and Merrill, joining a recent exodus that includes architects Adrian Smith and Gordon Gill. Lifson says Bey will continue to teach at U of I Chicago, as well as pursue photographic and writing assignments. At the Sun-Times, Bey brought a reporter's perspective to the coverage of Chicago architecture, which in this city is as important an industry as advertising - which has its own daily columnist in Lewis Lazare - and can evoke better and frequently more heated debates than you find in the sports section. Unlike most writers on architecture, including myself, who seem obsessed with superstar architects and big ticket projects, Bey got into the neighborhoods and made Chicago's entire urban fabric his regular beat. You can get a flavor of this on Bey's current website, whose gallery of illustrated mini-essays includes an appreciation of Marina City, to be sure, but also fifteen other important works of architecture and design from all across the city, with a special emphasis on some of the oft-overlooked wonders of the south side. Despite the chill that the prospect of competing against him sends up my spine, we can only hope that this latest career change means we'll have a lot more access to Bey's graceful prose and unique insights. 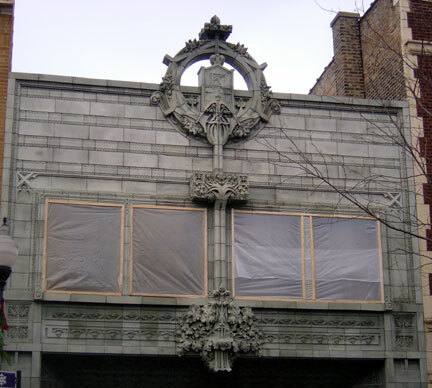 Via correspondent Justin Luety, we offer up shots he's recently taken of Louis Sullivan's last commission, the 1922 facade for the Krause Music Store. 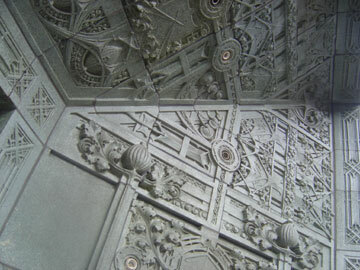 The building itself was designed by William C. Presto, who several years earlier had been sent to assist Sullivan as a draftsman for the construction of the Farmers and Merchants Union Bank in Columbus, Wisconsin. According to Sullivan biographer Robert Twombley, the facade project cost $3770, and the commission from the project provided Sullivan income at a time when he was in a desperate financial free fall that would end only with his 1924 death in a converted linen closet at the Warner Hotel. The Krause Music Store, in the 4600 block of north Lincoln, is a designated Chicago landmark. 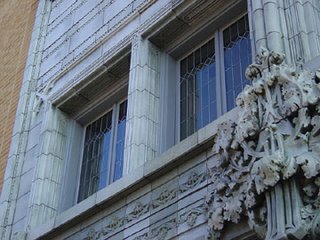 Luety informs us that scaffolding has just been removed, and that the facade, its terra cotta ripe to bursting with Sullivan's distinctive ornament, has never looked better. A full set of pictures can be found on Justin's own blog, Urbs in Horto, which also includes photo sets on Hyatt Center at 71 south Wacker, Frank Gehry's Pritzker bandshell, and on the Graceland Cemetary markers for Sullivan and John Wellborn Root, among others. Do 106 headless torso's an Agora Make? 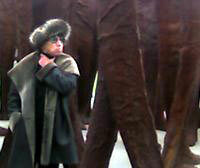 Edward Lifson of WBEZ's Hello, Beautiful has a great post on his blog on this week's dedication of sculptor Madgalena Abakanowicz's Agora, a ten million dollar installation, whose contributors include Robin Williams, which places 106 supersized lower torsos on a site in Grant Park just north of Roosevelt. Lifson's hugely entertaining and informative posting is a free-form riff including everything from a talk with the artist, a comparison with Eisenman's Berlin Holocaust memorial, the works of Rodin and Boccioni, and one of our mayor's own kind of improvisations that occur when an event actually takes him beyond his printed script and he begins to rap on his personal view of the city. Oh, and lots and lots of pictures. The post is all over the place, and all the better for it - it captures superbly the clash of ideas and "typologies" (sorry - I just came from Joe Rosa's Young Chicago), power modes and personalities. Thinking aloud should always be this good. Read and see it all here. Jeanne Gang: Architect as Businesswoman - The Trib's Sunday business section includes an interview by Susan Diesenhouse of Aqua architect Jeanne Gang, currently on tour with her IIT students in Brazil, which covers everything from practical aesthetics, handling large projects like the half-billion buck Aqua, and the influence of rising materials cost on architecture. Read it here before it goes into paid archive hell. 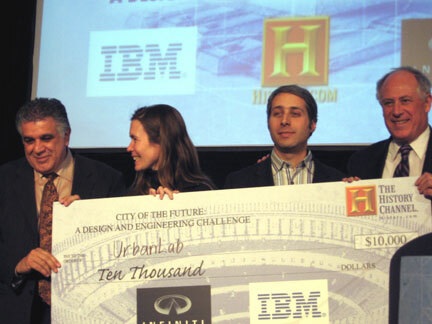 A team put together by UrbanLabs Sarah Dunn and Martin Felsen has won the $10,000 first prize in today's City of the Future competition., sponsored by the History Channel. 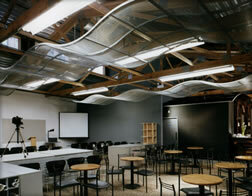 Strawn/Sierrelta and Valerio DeWalt Train/ARUP were the honorable mention winners. UrbanLabs moves on the competition finals, competing with teams from similar competitions held in NYC and L.A. details to follow.